Using a Dive Profile can help you when planning dives. 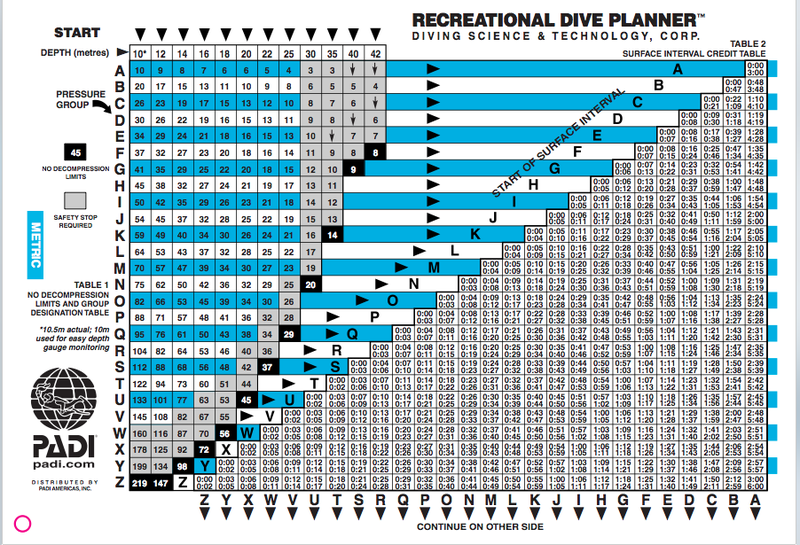 One of the skills that all divers should master is using the PADI RDP (Recreational Dive Planner) to plan a dive. Although most of us dive on computers, it’s good to have these skills so that you can plan your dives in the event that you are either unable to use your dive computer due to loss, failure or forgetfulness. 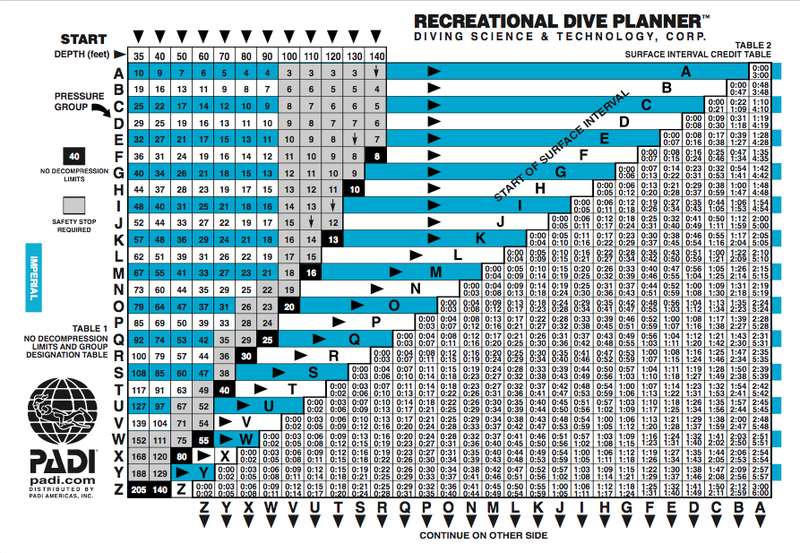 In this post there is a written example of how to plan 3 dives, and two videos that show you how to use the tables and the eRDPml to plan the dive. Let’s go over some vocabulary, I am sure you remember it all from your first open water course but it’s good to refresh. No Decompression Limit (NDL) – This is the maximum allowable dive time to a specific depth. Residual Nitrogen – This is the more than normal amount of nitrogen left in your tissues after a dive. Pressure Group (PG) – A letter that represents that amount of residual nitrogen in your body after a dive. Surface Interval – This is the amount of time that you spend on the surface between one dive and the next. Residual Nitrogen Time (RNT) – The amount of residual nitrogen in your body, expressed in minutes, you have remaining in your body prior to entering the water for a repetitive dive. Adjusted No Decompression Limit (ANDL) – The maximum amount of time you can spend at a specified depth on a repetitive dive. Dive Profile – A graphical representation of a dive. Actual Bottom Time (ABT) – The time you have spent on the dive. Total Bottom Time (TBT) – The sum of the RNT and the ABT, used after a repetitive dive to calculate the pressure group. Notice that the table is split into three tables. 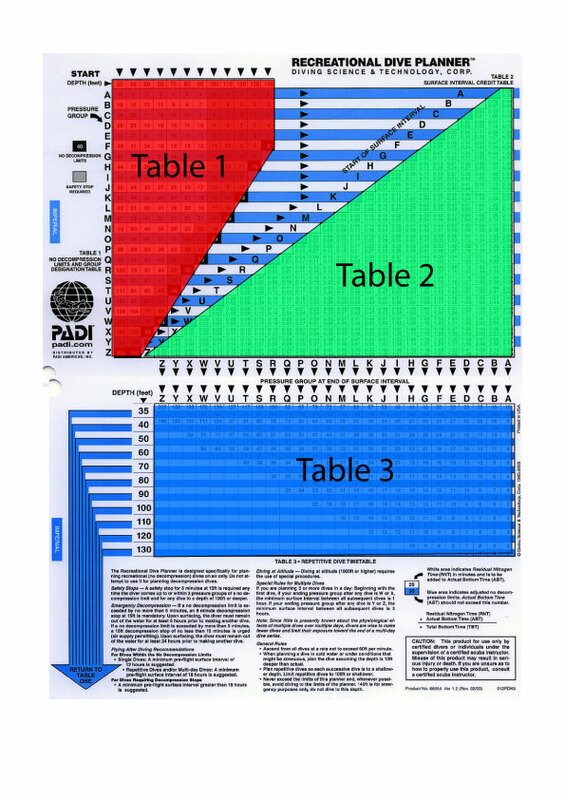 Table 1 allows you to calculate your pressure group after a dive. Table 2 allows you to calculate your pressure group after a surface interval. Table 3 allows you to calculate your Residual Nitrogen Time and your Adjusted No Decompression Limit. Now we’ve got the boring part out of the way let’s do an example. I am using the PADI Metric RDP (this means my depths are in metres). For this example we will be completing a dive profile for the following 3 dives. One of our goals will be to work out our Adjusted No Decompression Limit for the third dive, this will tell us how long we can stay down. What pressure group will we be in after we make a 15m dive for 40 minutes? For this part of the example you will only use Table 1. You will notice that 15m doesn’t appear on Table 1, so you must use the next depth that is higher. This means that we will use 16m. We go down that column until we find 40 minutes. Again, it doesn’t appear in the table so we must use the next time which is 42 minutes. Now we can read of the pressure group that we are in, move your finger cross to the left and you will come to a letter. It should be N.
Here is the dive profile completed for the first part of the problem. What pressure group will we be in after our surface interval? So we’ve just completed our dive to 15m for 40 minutes. We plan to stay on the surface for 65 minutes (1 hour 5 minutes ). Our starting pressure group is N and we want to work out our finishing pressure group. So now we use Table 2. We start from the N on Table 1 and move right across the table. You should notice that there are boxes with an interval of time in them. The first box we pass is for 0:00 to 0:03, we’re planning on staying on the surface for 65 minutes we need to keep moving right. Eventually you will come to a box that contains 1:00 to 1:08. That interval contains 1:05 so we can move down the table and we find our resultant pressure group. This pressure group is D.
Now we’ve filled in our surface interval and calculated the new pressure group. What is our pressure group when we finish the second dive? Now we need to turn to Table 3. Our starting pressure group is D and we are diving to 13m for a total time of 22 minutes. As 13m is not on the table we will use 14m. Locate the pressure group at the top of the table. Then locate 14m on the left of the table. Now scroll down from D and across from 14m, where these meet you will see a box. In that box you have two numbers. The number in white is the Residual Nitrogen Time and the number in blue is the Adjusted No Decompression Limit (scroll back up if you need a reminder as to what these mean). So we cannot stay underwater for longer than 76 minutes at this depth. We are planning on doing 26 minutes so that is OK.
Now we need to calculate the pressure group if we are wanting to do a third dive. So we need to take the Actual Bottom Time, which is the 26 minutes and we add it to the Residual Nitrogen Time to give us a Total Bottom Time of 48 minutes. Now we go back to Table 1. Find the depth of 13m (use 14m) and go down the column until you find a time close to 48 minutes (50 minutes in this case). We read across to the right and we see that we are now in pressure group N.
So we enter both the RNT and the ABT and add them together. This gives the TBT. Using the TBT and the depth of the dive we can use Table 1 to work out the pressure group. What will our pressure group be after the surface interval? Our plan is to do a 40 minute surface interval. We can follow the method that we outlined above that take us from Table 1 to Table 2. We start on Table 1 at N, we move right across the until we get to Table 2. We look for an interval that contains 40 minutes and we see that interval is 00:37 to 00:43. Scrolling down we find that we are in pressure group G.
How long can we stay down for at 11m, or in other words what is our Adjusted No Decompression Limit? So we can stay down for 112 minutes. This answers our original question, however let’s complete the table. This means we need to work out our final pressure group. What would our pressure group be if we did a 30 minute dive at 11m? Well we need to fill in our dive profile. RNT would be 35, ABT would be 30. Giving a TBT of 65. Using Table 1 we would look up 11m (12m as it is the closest) and scroll down until we found 65 minutes (66 minutes as it is the closest). This then gives a pressure group of O. Now we fill in the RNT, the ABT and calculate the TBT by adding them together. Using Table 1, 11m and 65 minutes we can now calculate the resultant pressure group. There we go we’ve completed a dive profile for three dives. Doing this with an Imperial RDP will give a slightly different set of results, but don’t worry about that. Both the Metric and Imperial RDPs have been thoroughly tested and as long as you stick to one then you can’t go wrong. It is definitely worthwhile practising this skill. It can be poorly taught and as divers ever more rely on computers it can quickly be forgotten. Here is a pdf file that contains blank dive profiles that you can use to practice calculating your pressure groups and Adjusted No Decompression Limits. Next post I will write about how to calculate the minimum surface interval between two dives. First and foremost let me state that you must receive formal training from one of the many dive organisations before attempting a dive. Without formal training you risk injuring yourself. Please get training before attempting anything you have read or seen in this post. I will not be held responsible for you attempting to use the methods contained in this post. The following post is for illustration purposes only. there is no 42minutes in table 1 next to N! And the table is in feet not metres, so 15 metres or even 16 metres is on the table!